We see meal times as another important learning opportunity here at The Baby Academy. Your child is encouraged to develop valuable self-help and social skills; collecting and returning their own dishes and cutlery, serving some of their own meals, passing dishes to friends, helping friends, conversing with adults and friends and participating in clean-up routines. It is also a time of day when they feel a sense of belonging to a community. It is important to us that your child is able to attend these parts of the day with their class. Your child feels very secure when they take their meals within a social group. It’s like a family meal time. Your child feels insecure and isolated if they arrive late and need to eat alone without their familiar social group (with an adult for supervision). We aim to provide healthy nutritious food for our children and for this reason; we provide fresh food. 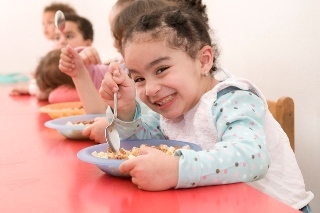 Children are offered a nutritionally balanced breakfast, a hot and healthy lunch, and a snack each day. Please make sure to inform admissions of allergies or medical needs; specify the food and allergy in order for this information to be added to the allergy list of each class. If your child is allergic to any kind of food and you have notified us of this allergy, you may substitute a meal from home. Check the weekly menus which are provided to help you. Time of arrival & departure from The Baby Academy may determine your child being eligible for meals. Weekly menu will be displayed in the Admission Area or ask for your copy from the Admission Office.